On being an incomer in Cornwall | Notes from the U.K. This entry was posted in Village Life and tagged Americans in Britain, Americans in England, anglophile, Britain, community, Cornwall, England, horticultural show, humor, village life by Ellen Hawley. Bookmark the permalink. Runner beans are basically green beans on steroids. They’re something other people eat. I don’t love them but will eat them. Wild Thing wants no part of them. They tend to be tougher than green beans, and not as tasty. But they grow well here, which green beans (called French beans here) don’t. And I’m with you about judging by the taste, but I don’t think that enters into it. Two things: sorry to hear that you are feeling unwell. I think that might be the same bug that was here in North America in the spring. It’s a stinker. Second, you realize, of course, that you wrote a post about the garden show. Thanks, we’re on the mend. And, umm, I guess you’re right: I did. Maybe at the heart of this community concept is the things that choose you. For instance bug #1 and bug #2. For example next year being sucked into the horticultural show even though you don’t want to be. For illustration serving grilled burnt burgers with a pantry of ingredients, because your guests refuse to eat real hamburgers. With some reflection, I realize that I have been through the same process, living as an American ex-patriot in Berks County Pennsylvania for the last 25 years. The people here are a thing unto themselves. Outsiders are made to feel unwelcome. You can pass the same person every day on the street for ten years before they acknowledge your existence. Defunct and nonexistent landmarks are referred to constantly. Words and expressions from the Alsatian area of Germany are still used after more than 200 years in this country. Those of us whom the community chooses (although we might have started out as African American or Puerto Rican or Sicilian or Gay or Straight or a knitter or an artist or Mexican) end up assimilating into the community, and are now just Dutch. Wow. The melting pot in action. That’s an amazing observation. Thanks for adding it. Yes, thanks for the bug which I must have caught from your 2nd Hamburger post. I feel you are being ingenuous as to the judging of runner beans. To a horticultural judge a kink or blemish on a bean is as glaring as a split infinitive must be to you. Think of the exhibits as paragraphs of prose. It will help. Sorry it had to be you I passed it on to. It was the only way to get rid of it. You’re right, I’m sure, about the runner beans. But just for the record, I love the split infinitive. The language wants to work that way. Let us boldly go where only a few grammarians have gone before. I’m sure you’re right. It’s gentle, but when I notice a change it seems to have happened all at once. Hope you and Wild Thing are both feeling better. Studly Doright and I have been in the Tallahassee, Florida, area for over a year, and I’m just now becoming part of the community. I know this because our next door neighbor and I exchanged emergency contact information in case her husband’s outpatient surgery became inpatient and she didn’t make it home to let their dog out. Yup, that’s a sign. You’re home now. And I forgot to say that yes, we are feeling better. Thanks. And, of course, I’m rude. Actually, I did remember that you’d asked if we were better, but by that time I’d posted my answer and somehow never did get back to it. Well I didn’t find your response to be rude. So that settles it. You mean I have to try again or rework my entire self-image? Sounds easier than trying again. Shutting down now…. I didn’t understand country music until I moved to a small town. Sure, there is a lot of jokes about country music and many of them are justified, and yes, much of the Nashville sound is over-produced pop… but at it’s core, country music is about a sense of place, either the place where you live or the place you ache to return to. It is about belonging. I find that unique. Having lived in the city, in the suburbs and in the burgs, I have spent most of my life living among people who were from somewhere else and who carried, at least in some sense, a feeling of not belonging. I know what you’re saying, but it made me think back to the neighborhood I grew up in, in Manhattan. about as far from small town as you can get. I don’t really know where anyone’s family came from–it wasn’t something we thought to ask–but the kids, at least, had a real sense of neighborhood, of community, and my sense is that the adults did too. That’s all gone now, at least in that neighborhood, because they gentrified the neighbors right out of there, but for that moment it was true. I’m guessing some parts of the city may still have it. As I think about it, our families were probably all immigrants a generation of two, or at most three, back. Our roots there didn’t go deep, but they were real. Saint Paul used to be a collection of communities. Much of this had to do with Realtors. Their first question was always, “what church do you go to?” It defined your race, religion, ethnicity and class. They used the answer to put you where you belonged – and keep you there. The practice is illegal now – as well it should be, but it did created social cohesion and a strong sense of community – for better or worse. My wife’s family celebrated 150 years on their family farm a few miles north of here. In the scheme of things, that is not all that long but it is long enough so that her grandparents knew the same families she does. There are a lot of immigrants coming here from exotic places to work in the vegetable, pork and poultry processing businesses and though they are from far away, I think that a lot of them are more comfortable with living in a place where people feel they belong, rather than a place that feels rootless. I think one element that created a lot of communities in the U.S. was the way immigrants tend to draw family and friends and community members to them. The Jewish immigrants (at least around the turn of the last century) had landsman societies–organizations of people from one town, maybe, one country, one village. They helped newcomers to settle in, and inevitably strong bonds grew up. To some extent, they were pushed together by real estate schemes and discrimination, but to an extent they lived close to the people they knew. That was safety, family, familiarity, community. I expect other immigrant communities have similar ways of helping the newest immigrants, formally or informally. In some ways, I’m sure those communities were wonderful, and much needed. In other ways, those bonds were suffocating–at least to my father’s generation. I know my father wanted nothing to do with the old world, and the last name I carry was part of his effort to assimilate and escape the community. And partly as a result of that, I can’t imagine what it would be like to know the same families my grandparents knew. The Irish American Cultural Center is a huge pile a quarter of a mile from Ocean Beach and directly across from the zoo…..best clean toilet facilities in the neighborhood. Now there’s a travel tip for you! A travel tip worth having. I like the idea of the community of germs…never thought of that one. Don’t like being part of one, just the concept. ☺ I broke out of my small town rural community, couldn’t wait to leave, and at times, am a bit homesick for a place where everybody knows your name, your family. (and your personal business ??) Maybe I was right to leave. Community’s never an unmixed blessing–from the germs to everyone knowing your business, or thinking they do and inventing it when they’re not sure. At 68, I love it. At 19? It would have driven me insane. I think it’s a mistake to say you and Wild Thing can never be “fully part” of your community. You two are an eccentricity, The Yanks, the dash of bright color in the mosaic that makes a painting breath-taking instead of just pretty. You’ve talked about so many connections you’ve made there. And I bet there are places where you walk in and people greet you by name. That’s community for me. Going to my coffee shop and the owner already knows what I want. Then, asks about my cat. I think going to the Horticultural Show as a helper (and observer) the first time out is a brilliant idea. I’m sorry you were (are) sick. Next year. Think of the comic possibilities! The comic possibilities are endless. Tune in next year. I like what you said about the dash of bright color in the mosaic. You’re right, really. We’re part of the community but will never be old village. I guess that’s what I was reaching for. I went to the state fair yesterday and thought the same thing about eggplant that you thought about the runner beans. I don’t get it. Wasn’t happy with the first place quilt, either. 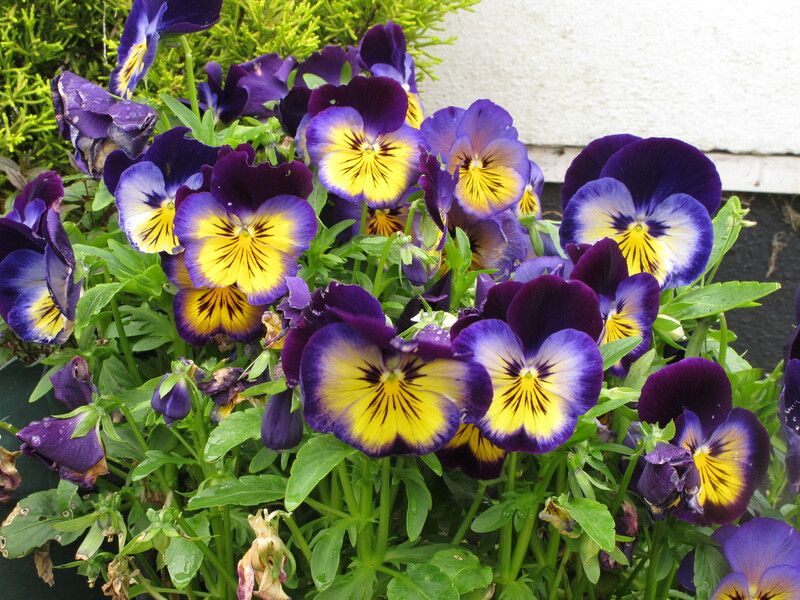 Anyway, that bit about pansies is totally understandable. When I moved to Georgia, there were pansies out in December and I was like, “Whaaaa? Nooooo!” But yeah, they are winter flowers in Georgia, too hot in spring or summer. I never could adapt there. Here it stays cool in the summer, so they’re winter and summer flowers. One of these days I’ll ask the right person and find out whether there’s any real difference between the ones they sell as summer pansies and the ones they sell as winter ones. I suspect it’s all about when they’re on sale. I just saw a tray of cyclamen for sale–a true winter flower here. I’m in shock. Is it really that late in the year? Great post! thanks for replying to my comment on the Saigoon motorbike post. Speaking of the spidery UK, my housemate was UK born and reared, and I visited her twice in two different Barnes’ accommodations, one on Priest’s Bridge Road. My daughter and I spent 5 days in Oxford in June, and were sorely disappointed that Cornwall would have taken too much time on our trip. I live in San Rafael, CA and grew up in San Francisco. I was introduced to Gilbert and Sullivan there through a now lifelong association with the World Class San Francisco Lamplighters Theater. How I longed to be a Cornish daughter. My own daughter is a singer and has performed the Pirates’ role, Edith, so you can imagine how we wished we could have made it there! I sense we are in similar life situations; I am divorced with retirement and posssible relocation down the road. I have an idea I am really going to enjoy following you! Penzance (as in The Pirates of) is at the end of the rail line–a beautiful town, but from Plymouth on the tracks must be bad because the trains slow waaay down and it takes forever to get there. Did you even watch the Pirates movie with Linda Ronstadt playing–oh, Whatsername? You know the role of Whatsername, right? Is that Edith? They manage to spoof almost everything about Gilbert and Sullivan and in the process do it more justice than a straight production ever could. It’s wonderful. Sounds like to me, you have ‘Arrived’ and had a few years knocked off your ‘outsider’ tag. In these parts of South Yorkshire, you would be known as ‘The Moverinner’ and, even though you would make lots of friends and be totally involved and accepted in the community, behind your back you would be ‘affectionally’ be known as the ‘moverinner’ for at least the next 15-20 years …..
I’m sure I am here too, although as an incomer, –and will be for the rest of my life. My friend J. just told me about her grandmother’s phrase, “For that I have not been long enough in this country.” She moved here in 1909 and was still saying it in the fifties. It has definatly got better over the years. 40 years ago my parents moved us from London to a village in North Devon. We were outsiders although as kids we easily made friends my parents did not. My dad committed the unforgivable sin of not only being from London but also Danish and have a foreign name. After about 5 years some people did start speaking to my mum but I think that was only after helping out in the local shop for free when the owner was poorly. Interesting comment. I think what’s happened is that, at least in our village, a lot of outsiders moved in before us. You can still see the outlines of the old village and the current village, but people do speak, and mix, and form friendships. I can easily imagine that helping the shop owner would have marked your mother as someone worth speaking to. It was 40 years ago North Devon has changed a lot now with lots of incomers. My wife down here 9 years ago and it wasn’t as bad.